Continuing the tradition of quality and value. CECO has been delivering quality OEM SuperiorSM products and services to the gas transmission, gas processing, and petrochemical industries since 1964. CECO’s Emissions Testing Services group continues this tradition of quality and value. 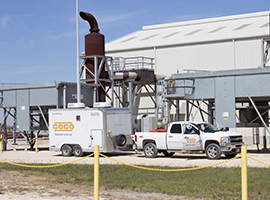 CECO Emissions Testing Services offers specialized stack testing⁄air emissions testing on reciprocating engines, turbines, and generators. Our engineers, technicians, analysts, and air quality scientists are experts who focus specifically on the natural gas industry. With insight that only comes from experience, we assist our clients with tough compliance issues and challenges through our knowledge and understanding of the industry. Our emissions and analysis team members are widely considered some of the best and brightest engine and compressor experts in the natural gas industry. We are frequently called upon to provide real world, useful solutions and solve our clients’ toughest problems. With an ever expanding knowledge base and possessing the latest in measurement technology, we know how to troubleshoot, correct, and implement solutions to ensure efficient, reliable engine and compressor operations, and successful emissions compliance programs.